"At Green Label Packaging, responsiveness to our customers' needs is our primary mission. This unwavering commitment to total customer satisfaction is the foundation upon which my father has grown GL Packaging over the last thirty years and will continue to be our main focus in the years to come." GreenLabel Packaging has been solving packaging problems for over 30 years. Established in 1984 as GL Wood Products, we grew to be the Midwest's leading manufacturer of quality top frames and pallets. With the addition of many new products and services to meet customer needs, we changed our name in 1995 to GL Packaging and recently started DBA as Green Label Packaging. Located in West Chicago, Illinois, our modern 40,000 square foot facility contains both our production areas and extensive inventories of raw materials and finished goods. We also house inventory in Crossett, AR and a second corrugated pallet production facility in Grenada, Mississippi. There are times when your shipment may require a special pallet or void filler for your product to arrive in one piece. Or maybe your company is looking for a cost efficient alternative to standard wooden pallets. Utilizing the latest packaging innovations, Green Label Packaging provides complete support for the development of new packaging or problem solving of existing applications. At Green Label Packaging, our policy of employee cross-training within all areas of our operation helps insure that your call will be handled promptly and in the most professional manner. Our modern computer system and trained staff is your assurance of our efficient control of your business and prompt response to your inquiries. At GL Packaging, we make sure that the customer is always number one. To improve our capability to serve existing customers and potential new business in the southern US, GL has expanded the manufacturing of Ecodek Pallets to Mississippi. Our southern plant is just hours from Louisiana, Arkansas, Tennessee, Texas, Missouri, Alabama & Georgia. 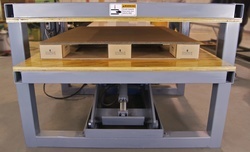 Depending upon the pallet needed your order can be ready in just a day or two. Our production facility in West Chicago, Illinois continues to service customers in the Midwest and due to the demand of our product, we have been shipping direct nationwide and to Canada. With two Ecodek production plants, and a trained staff located throughout the United States, you can be certain that we will understand your pallet needs, and be able to serve your facility in a timely manner. The corrugated packaging industry is the leader in manufacturing natural, recyclable packaging for many years. Corrugated paper does contain wood pulp, a sustainable, renewable, often-farmed resource using wheat or cornstarch to glue it together. It is recyclable, and biodegradable. In fact, 78% of all corrugated is recovered for recycling, which makes corrugated the recycled leader in the packaging industry. Nearly 60% of the energy used by the US paper industry comes from renewable biofuels. Green Label Packaging ensures that the paper we use in the manufacturing of our pallets is acquired from mills that source only from responsibly managed and renewable sources. All mills which we purchase corrugated paper are certified to the Sustainable Forestry Initiative® (SFI) sourcing standard. In addition to the inherent green attributes of the corrugated product itself, we have an excellent design and sales department whose goal is to provide quality, strong products using as little material as possible. In daily operations, being a sustainable company is a top priority, from creating less waste, using less energy and recycling. In our West Chicago facility, during the cold winter months, we heat our factory by cleanly burning wood chips which we make using discarded wood pallets. Anything burned as fuel that comes from plant material within the last few hundred years is considered carbon neutral (calculating the impact on global warming = same BTU per dry pound of wood). GL Packaging will continue to seek new ways to improve our performance in recycling, sustainability, energy efficiency, and source reduction' while providing sustainable products for our customers. In an effort to improve the way the world packages and transports its products, we are constantly developing new items. Our website is designed and managed in house to let you know our product line, communicate with us, and inform you of the exciting changes we are working on for the transport packaging industry.